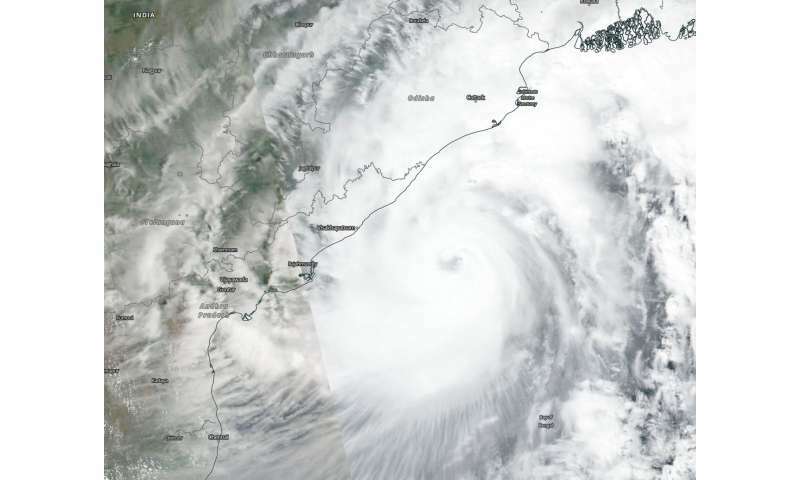 The Joint Typhoon Warning Center or JTWC issued the final warning on Tropical Cyclone Titli after it made landfall on the northeastern coast of India late on Oct. 10. NASA-NOAA's Suomi NPP satellite captured an image of the large storm before landfall. The Visible Infrared Imaging Radiometer Suite (VIIRS) instrument aboard NASA-NOAA's Suomi NPP satellite analyzed Tropical Cyclone Titli in visible light early on Oct. 10 when its eye was over the Bay of Bengal, Northern Indian Ocean. Titli stretched from the Indian state of Andhra Pradesh northeast into West Bengal. Before and after landfall, animated enhanced infrared satellite imagery showed strong thunderstorms surrounding a defined eye. On Oct. 10 at 11 p.m. EDT (Oct. 11 at 0300 UTC) Tropical Cyclone Titli had maximum sustained winds near 90 knots (103 mph/166 kph). It was centered near 9.1 degrees north latitude and 84.4 degrees east longitude, approximately 312 nautical miles southwest of Calcutta, India. Titli tracked west-northwestward. Titli came ashore near Palasa in Srikakulam district of Andhra Pradesh. Heavy rainfall is forecast for the districts of Ganjam, Gajapati, Puri, Jagatsinghpur, and Kendra. The storm has taken 7 lives. Strong winds battered many parts of the state of Andhra Pradesh and neighboring Odisha. By October 13, JTWC expect Titli to dissipate over land.